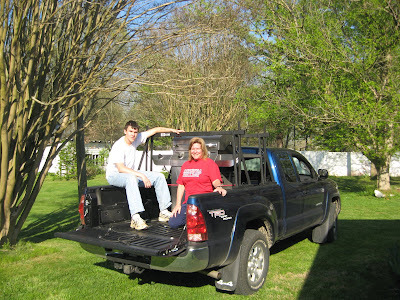 I sent a sturdy country boy off to UNC-Chapel Hill, and they have sent him home about 30 to 40 lbs lighter. Oh my. I guess they don't have home cooking at Chapel Hill. Not much fast food either right there near campus - unless you count bagels and wraps. I've sent snacks, but those just aren't sticking to his bones too well. 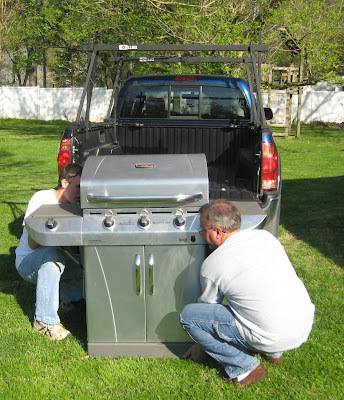 So, now we've loaded up a Char-Broil gas grill to take to his fraternity Zeta Beta Tau (ZBT) at Carolina. Whew! After we managed to run into the dog trolley and jerk the side board off the garage and then get that back up and the dog set, it was time to load the grill. The Char-Broil Quantum actually was not as heavy as expected or as heavy as it looks. I can say that, of course, since I was taking the pictures instead of giving the heave ho. 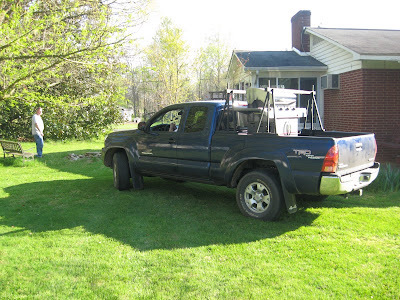 In any case, the college kid's brother and Dad got that grill hefted up in the truck. The kayak racks came in handy for stabalizing the gas grill, With bungie cords and a little creative looping, the grill passed my shake test. If it blows out down the highway, then I will document that and rethink the kayak rack and bungie thing. So as not to rip any more boards off the garage on the other side of the house and for the sake of the dog who does not like vehicles anyway, I had the guys take the grill around the far side of the house. I thought this was at the sacrifice of a flower or two, but the truck fit exactly and did not wipe out any flowers. Tomorrow the grill will be at the frat house. It's a Char Broil infrared with three burners in the Quantum Professional series. It includes a covered side burner.